Using data from NASA’s Spitzer Space Telescope, researchers have developed a new theory explaining the mystery of planet-forming disks that circle the young stars. Researchers using NASA’s Spitzer Space Telescope to study developing stars have had a hard time figuring out why the stars give off more infrared light than expected. The planet-forming disks that circle the young stars are heated by starlight and glow with infrared light, but Spitzer detected additional infrared light coming from an unknown source. “If you could somehow stand on one of these planet-forming disks and look at the star in the center through the disk atmosphere, you would see what looks like a sunset,” said Neal Turner of NASA’s Jet Propulsion Laboratory, Pasadena, California. In the 1980s, the Infrared Astronomical Satellite mission, a joint project that included NASA, began finding more infrared light than expected around young stars. 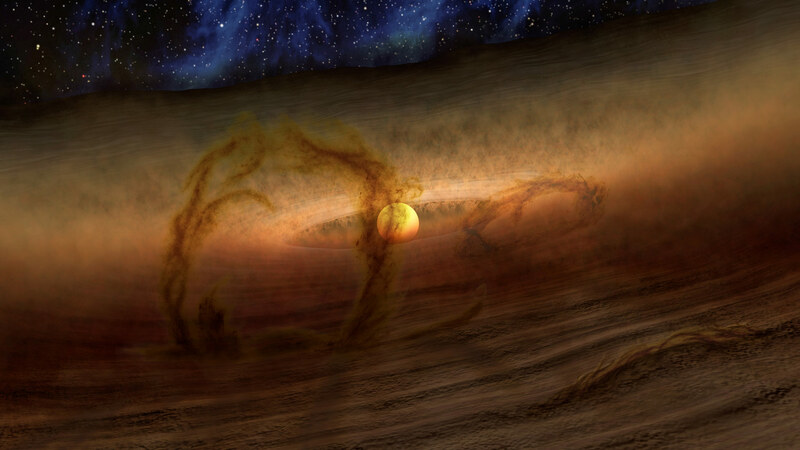 Using data from other telescopes, astronomers pieced together the presence of dusty disks of planet-forming material. But eventually it became clear the disks alone weren’t enough to account for the extra infrared light — especially in the case of stars a few times the mass of the sun. One theory introduced the idea that instead of a disk, the stars were surrounded by a giant dusty halo, which intercepted the star’s visible light and re-radiated it at infrared wavelengths. Then, recent observations from ground-based telescopes suggested that both a disk and a halo were needed. Finally, three-dimensional computer modeling of the turbulence in the disks showed the disks ought to have fuzzy surfaces, with layers of low-density gas supported by magnetic fields, similar to the way solar prominences are supported by the sun’s magnetic field. Over the next few years, astronomers will further test these ideas about the structure of the disk atmospheres by using giant ground-based telescopes linked together as interferometers. An interferometer combines and processes data from multiple telescopes to show details finer than each telescope can see alone. Spectra of the turbulent gas in the disks will also come from NASA’s SOFIA telescope, the Atacama Large Millimeter/submillimeter Array (ALMA) telescope in Chile, and from NASA’s James Webb Space Telescope after its launch in 2018. JPL manages the Spitzer Space Telescope mission for NASA’s Science Mission Directorate, Washington. Science operations are conducted at the Spitzer Science Center at the California Institute of Technology in Pasadena. Spacecraft operations are based at Lockheed Martin Space Systems Company, Littleton, Colorado. Data are archived at the Infrared Science Archive housed at the Infrared Processing and Analysis Center at Caltech. Caltech manages JPL for NASA. Be the first to comment on "New Models Better Describe How Planet-Forming Material Around Stars is Stirred Up"